Following labels and application rules are always important. A big reason for the rules is to prevent residues on harvested grain. These three questions provide a quick primer. 1. Keep an eye out for insects. 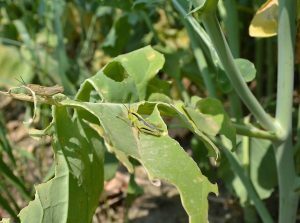 The CCC Insect Scouting Guide can help with identifying pest and beneficial insects. 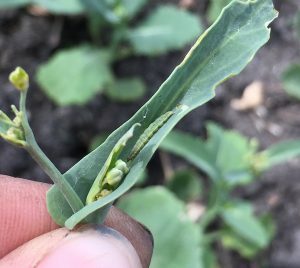 Pod damage from insects, including lygus, bertha armyworm and diamondback moth larvae, tends to be the most costly damage at this time of year. That’s because plants well into pod stage are getting out of flowering — and once flowering is done, the plant can’t compensate for lost pods. If spraying is necessary, choose a product with a pre-harvest interval in line with when you expect to cut the crop. Confirm pre-harvest intervals here. What can you do with lodged canola? 1. Green and bendable canola stems can often straighten up again (somewhat) if lodged due to wind and heavy rain. 2. If lodged due to disease, these plants are unlikely to straighten up. Plants lodged this early due to disease usually contribute little to yield once harvest rolls around. 3. Lodged plants can be more susceptible to spread of sclerotinia stem rot and alternaria from plant to plant. 4. Lodging can influence harvest management decisions, including whether to swath or straight combine the crop.